Meet Sarah. She's A World Beater. 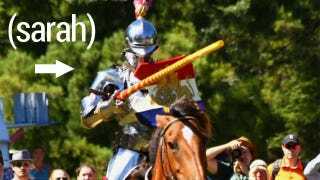 At Jousting. Proving there really is a sport out there for everyone, Australian school teacher Sarah Hay is the best woman - and one of the best humans - in the world at...jousting. Seriously. In the full armour and everything. Regular readers of Kotaku will know this stuff isn't new, or rare; people all over the world love nothing more than dressing up in metal plate and beating the crap out of each other. But wearing armour and whacking a dude with a sword is easy. The fact there's a jousting scene, which takes an insane amount of preparation and skill (not to mention access to badass horses), is super impressive. Sarah's only been competing for a few years, but has already won a couple of major global championships. She also alternates between jousting and horse archery. You can see her in action below.